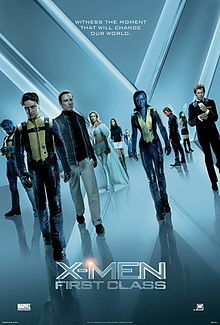 On Thursday evening, CollegeInstructor and I went to watch X-Men: First Class. I loved it. Thoroughly enjoyed it :) Definitely recommend it. Haha. Friday was quieter. I picked up pizza and went over to The Trucker's house for dinner and we ended up watching The Joneses, which I'd seen before but he hadn't. And we were both definitely in the mood for something light. On Saturday I was on a mission to hunt down something to wear for the 90s party we were going to that evening. So we had breakfast at Foood in Cresta. And I spent the rest of the morning trying to reassure The Trucker that really, I wasn't that bad when shopping normally ... only when I have to find something so specific. Hahahaha. Poor boy. But, I did find something in the end. Erring on the side of the 80s, because really, for me, the 90s ranged from Standard 3 (Grade 5) till I finished college. It was a bit varied. Some people got it amazingly spot on tho! Hahaha. The party was fab, at a place called Salsa in Illovo. It was great fun. Lots of the work crowd and everyone got to meet The Trucker. Although I think he felt a bit lost ... like all the other partners. Oops. Ah well, I guess it happens. Sunday was very relaxing. Breakfast with one of the Trucker's friends and then a lazy day spent reading in the sun and an afternoon nap.